Many towns on the plains were built as the railroad progressed, but few grew to be as large and important as Laramie. It makes sense, then, that the center of the city would be the Union Pacific Railroad depot. The original depot, located in the northern area of town on 3rd Street eventually expanded to include a hotel. 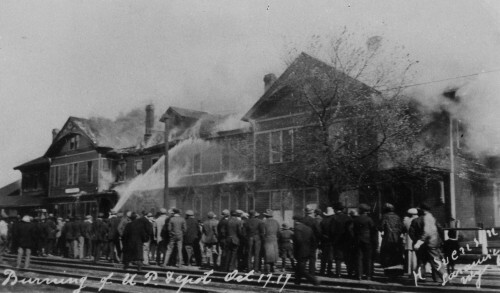 When a fire swept through it, a new depot was built on Second Avenue near Garfield. With the advent of the automobile, passenger train travel diminished. Today, the depot is open to the public as a museum dedicated to those early railroad days. Learn more about the fires that have affected Laramie and Wyoming.